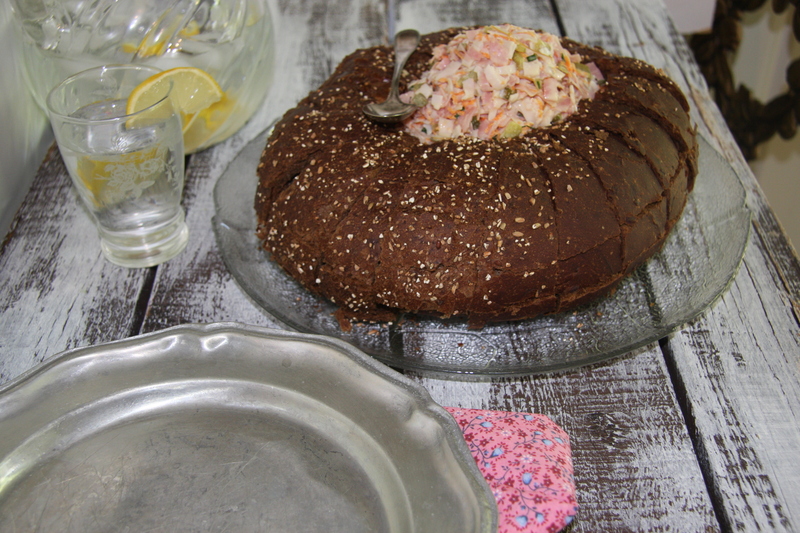 This recipe stems from one I used to make years ago. I think everyone made it then. It’s a great appetizer or snack and one that is easy to make. 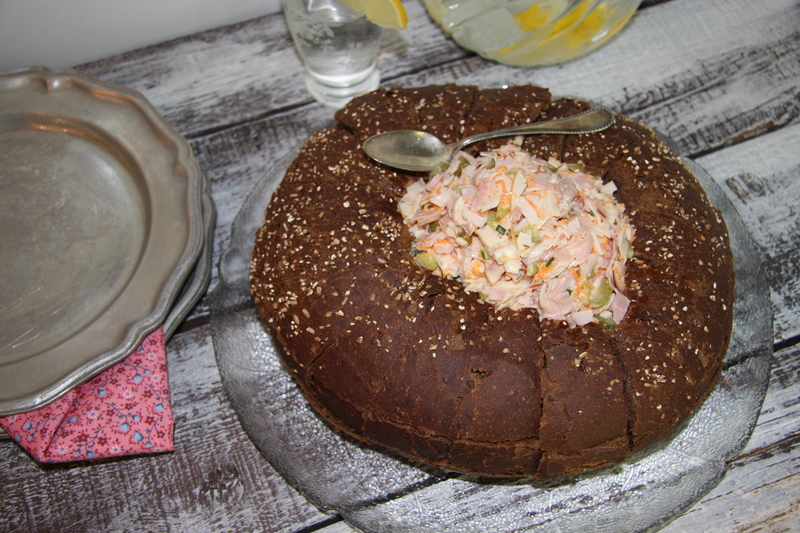 Great for parties, BBQ’s, snacks, even as a meal with a salad. It does feed a crowd, looks impressive and like you spent some time putting together. Whenever I make this I always get asked the recipe. How can you go wrong with something like that? Then cut it in 3 sections across, starting at the bottom but not cutting all the way through to the center. Next starting at the top, slice it down but not cutting all the way through to the center. 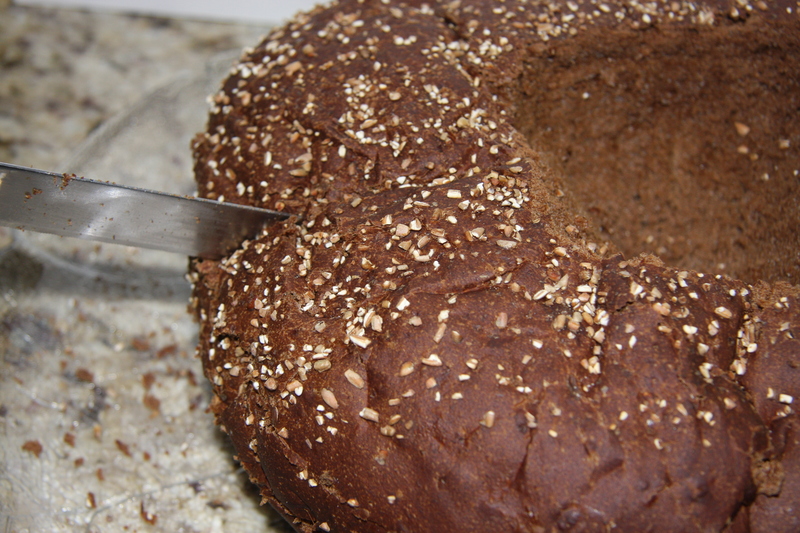 If the bread is still a bit frozen then you can hold the cubes, push them in but they should not fall out. Set aside. 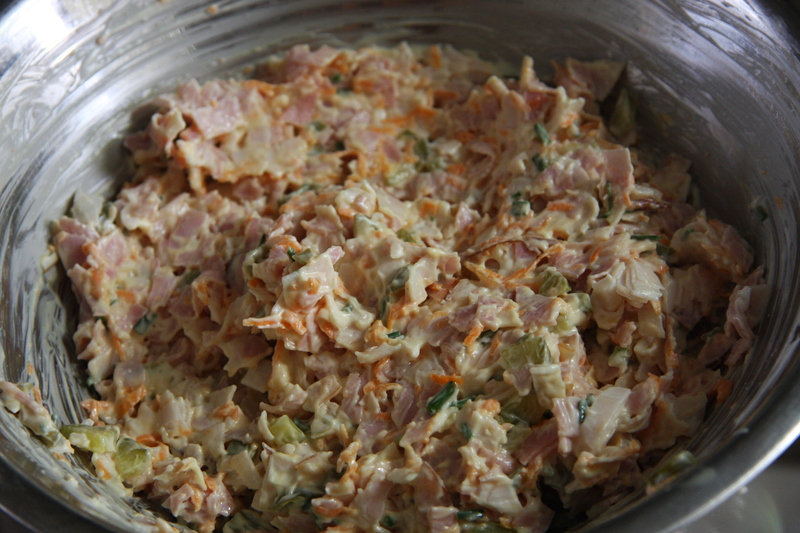 In a bowl add finely chopped slices of ham, 1 stick of finely chopped celery, 1 grated carrot, 1/4 cup of finely cut chives, 2 finely chopped smaller dill pickles and mayo. Mix well. Cover and refrigerate for a couple of hours. 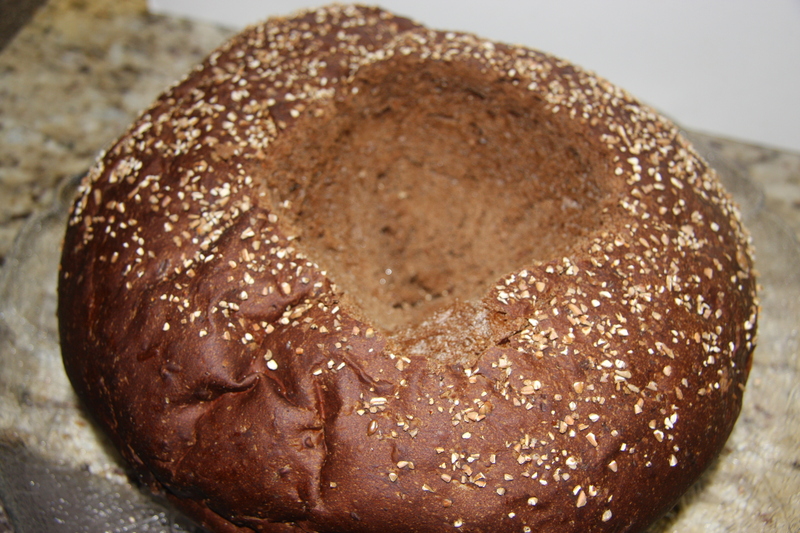 Take your cut bread bowl and fill it with the spread. It will surely be a hit.! 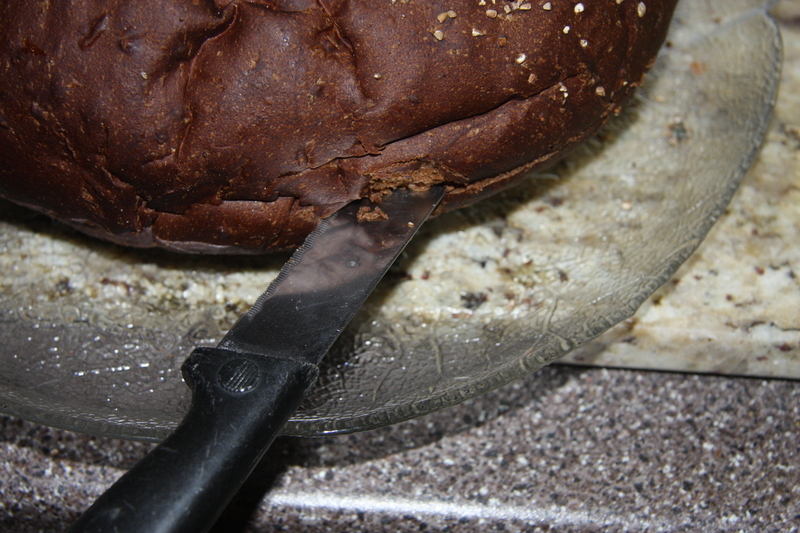 Place a partially frozen loaf of pumpernickel on a serving plate, hollow out the middle and cut it in 3 levels across, making sure not to cut through to the middle. Then starting at the top slice it down towards the bottom all the way around to form cubes. Do this but make sure not to cut all the way through to the middle. Set aside, covered well. 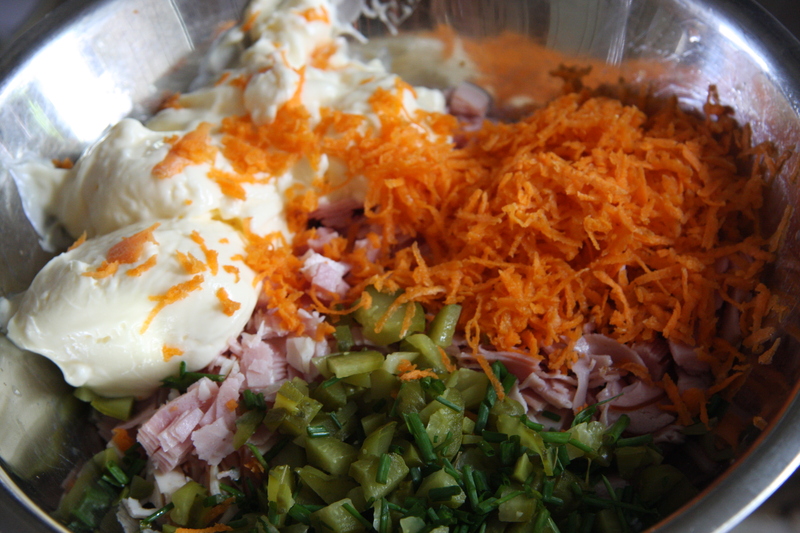 Mix together all the chopped veggies, ham, chives and mayo. Place this into the fridge for a couple of hours. When ready to serve place into the bread bowl with the hollowed out pieces around the bottom of the bread bowl.